Never post a serail number / CD-Key on a public board! Strongly recommend you edit your original post and remove your e-mail ID as these boards do get read by e-mail bots harvesting e-mail addresses. Unless you like spam. When you say "saving images to discs", do you mean image as in "picture" files like .JPG or .PNG, or do you mean disc image files like .ISO? What version of Roxio are you running? And what version of windows? What brand of disc are you using? And is there a particular reason you're using CD-RW discs? Are you reusing the discs? And if so, do you have more problems with discs that you've used many times? If you are strictly archiving, and only want to add pictures and never erase them, you can do that with CD-R discs. If you have more room on the disc, uncheck the "Read Only" box when you write your disc so that you can add more files later. I have NO Idea what happened to my reply....so I'll try it again. I use memorex CD-RW disc and have for years no problems. I tried using CD-R but they didn't work. I save the images as a Jpeg when the save icon comes up I save it into the Blank Disc and I can see the images in the disc as I have it opened up. I use Roxio Creator 9.0. But when I take the disc out using the proper way and I put it back in there comes an error. It says that it can't find files and that it may be currupted. I have a Dell Desk Top computer that uses Windows XP. Are you using Drag to Disc application? Memorex CD-RW disc's are probably the worst RW disc's out there. A CD-R will work if you use it correctly. My first suggestion is to try some other brands of blank discs, CD-R or CD-RW. You do have to format the discs for use with Drag To Disc (D2D) before it will write data to them. Okay... I just loaded up EMC 9, though mine isn't the Dell version. Instead of D2D, I would strongly suggest that you use Creator Classic. Open EMC9, select Data Disc, and Creator Classic, hopefully that is part of your Dell version. If you use a CD-R, make sure you un-check the "Read Only" checkbox as shown in the image below. That way you'll be able to add more images to the disc until it is full. 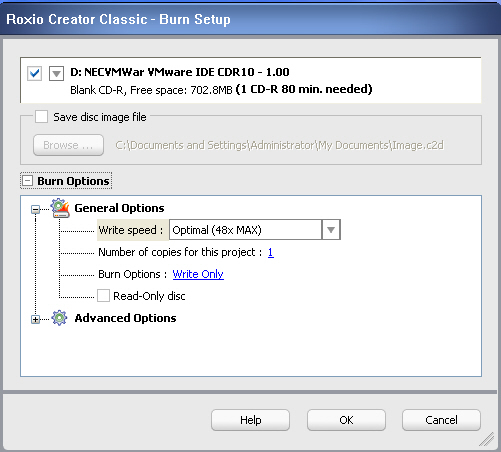 Also, you need to use a blank, not formatted, disc for Creator Classic. Thanks so much I'll look into this tonight. I have tons of Video projects to do first.